"NASA's Spitzer Space Telescope took this image of a baby star sprouting two identical jets (green lines emanating from fuzzy star). 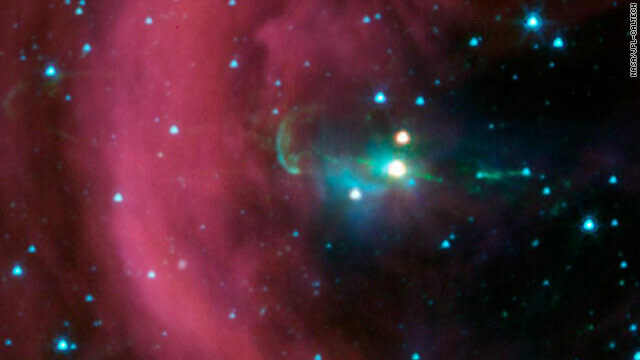 The jet on the right had been seen before in visible-light views, but the jet at left - the identical twin to the first jet - could only be seen in detail with Spitzer's infrared detectors. The left jet was hidden behind a dark cloud, which Spitzer can see through. The twin jets, in a system called Herbig-Haro 34, are made of identical knots of gas and dust, ejected one after another from the area around the star. By studying the spacing of these knots, and knowing the speed of the jets from previous studies, astronomers were able to determine that the jet to the right of the star punches its material out 4.5 years later than the counter-jet. The new data also reveal that the area from which the jets originate is contained within a sphere around the star, with a radius of 3 astronomical units. An astronomical unit is the distance between Earth and the sun. Previous studies estimated that the maximum size of this jet-making zone was 10 times larger. The wispy material is gas and dust. Arc-shaped bow shocks can be seen at the ends of the twin jets. The shocks consist of compressed material in front of the jets. The Herbig-Haro 34 jets are located at approximately 1,400 light-years away in the Orion constellation." and does reasonable gitnhs. I am neither conservative nor liberal, but the soul of sweet reason. Therefore, all who differ with me are, as you might have guessed, unreasonable.I was born in Paterson, NJ Founded by Alexander Hamilton who lived in Manhattan at the time. He didn't insist that it be called Paterson, New York or New York Paterson. The failure to change the name by the football teams was a huge slap in the face considering the profit margins are dicated by Television and sales revenues, not ticket sales and the fact that when Meadowlands Stadium was built, it was at the taxpayer of New Jersey's expense. Keep in mind that Brendan Bryne got ambused by David Rockefeller and and the NY Banks who pulled funding at the last minute in an attempt to scuddle the stadium and the deal to bring the Giants to New Jersey. Bryne pulled a rabbit out of the hat by getting NJ banks to finance the deal.Even when the Giants were in NY, 2/3rds of the season tickets were held by New Jerseyans. We was robbed!! As technology is revealed to us through the all wise powerful creator, we will gain more and more insight into how God creates worlds without number. Since we are God's in embryo anyway, these findings are very stimulating and show us what potential we have.